Shaliene Woodley made it a date night for her attendance at the world premiere of her new film 'Adrift' at L.A. Live Regal Cinemas in LA yesterday evening(May 23rd). 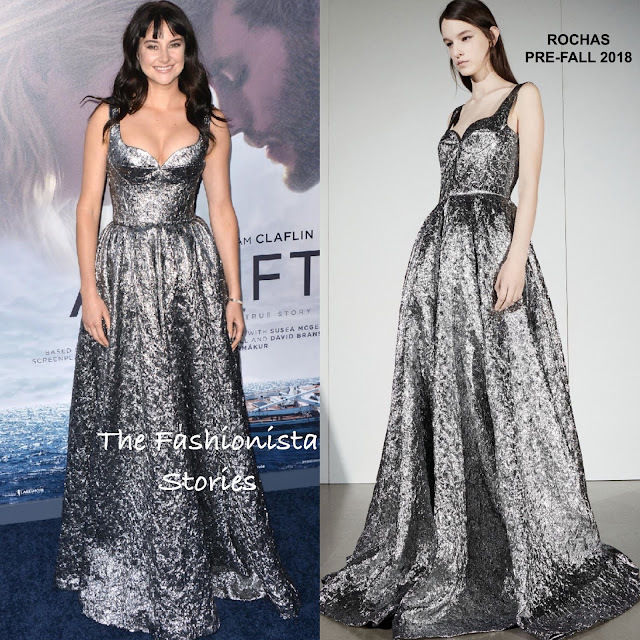 Serving up a little cleavage action, she wore a ROCHAS PRE-FALL 2018 silver metallic bouclé gown that mimics the appearance of a silver leaf. I really like the fit of the gown on Shailene, she looks lovely. However the her hair & make-up is a bit lack luster and it could have enhanced the overall appeal of her look. She finished up with FOREVERMARK jewelry and GIUSEPPE ZANOTTI sandals. Are you feeling Shailene's shiny look?